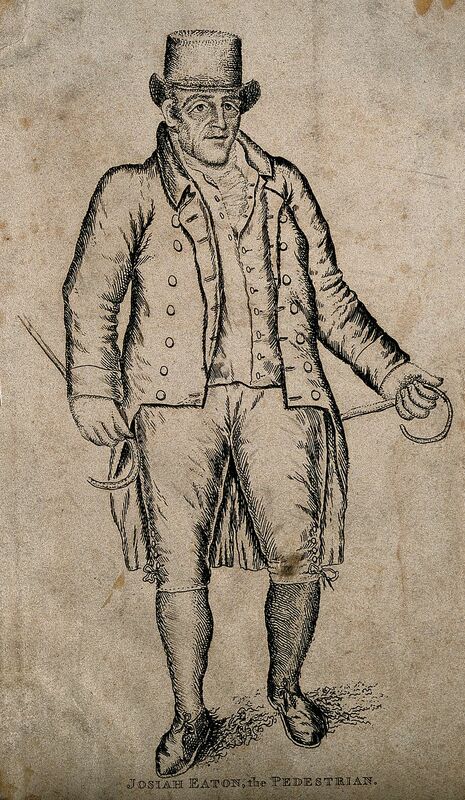 A few months ago the blog covered the tale of George Wilson, the Blackheath Pedestrian who attempted to walk 1000 miles over 20 days in the late summer of 1815 around a mile course from the Hare and Billet. Wilson was prevented by local magistrates from completing his walk, while they eventually backed down; he failed in his challenge as there was a gap in the walk. The landlord of the Hare and Billet clearly saw pedestrianism as a means of increasing his income and another even longer walk was planned for a couple of months after Wilson’s ill-fated attempt. The pedestrian this time was Josiah Eaton, the Woodford Pedestrian. The nature of the walk was a little different to Wilson’s; the Blackheath Pedestrian was to walk 50 miles a day in one block of walking. While the daily distance to be covered by Eaton was just 24 miles, the big difference was that it was that a mile needed to be completed in every single hour – meaning that there was no potential for any sustained rest. This was the same approach to distance walking as that used by perhaps the most famous pedestrian of the age, Captain Barclay. The route though was the same mile loop as Wilson’s – which is likely to have have taken Eaton from the pond next to the Hare and Billet along what is now Goffers Road past Whitefield’s Mount (covered before in Running Past), the top right image above. It would be then towards the location of the Tea Hut (although there would have been a 250 year wait for a cuppa) . 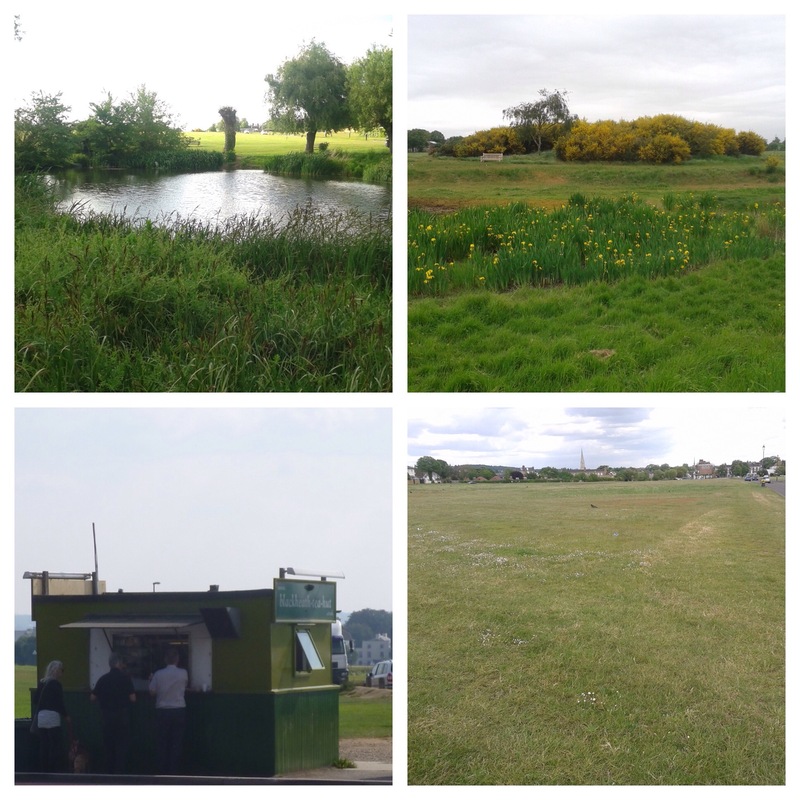 It would then across the Heath to close to the junction of Wat Tyler Road and Hare and Billet Road (bottom right photo) before returning along the latter – one of the old roads across the Heath. Eaton started on 10 November 1815 and was due to finish his task on Boxing Day. The Times noted on 18 November that when he started, the betting had been against him completing the walk but after a week the smiling Eaton was winning the gamblers around despite poor weather (1). His walk was completed at around 8:15 on Boxing Day but he kept on until dusk to satisfy the crowds that gathered during the day and to enable a ‘large party of respectable persons’ to watch him at 4:00 pm (3). Josiah Eaton will undertake, at the completion of his present task, to perform another thousand, or even fifteen hundred miles in as many hours, as The case may be, without resting from the fatigues of his present undertaking. Or he will start immediately against any other man, to walk a mile an hour until either decline the contest, for a proportionate subscription, to belong entirely to the winner. All claims to the subscription, however, to be abandoned by either party on the non- performance of the task. Eaton will also, for a subscription of one thousand pounds, undertake to walk one mile every hour for three months successively; and should he fail, even towards the conclusion, he will forfeit all claim to reward. Eaton, for an. adequate subscription, will undertake to walk 60 miles per day, for- 10 days successively, and of course to forfeit all^ claim to reward if he failed even on the last day. Little is known of Eaton prior to his 1100 mile walk on Blackheath other than he was born in Woodford in Northamptonshire around 1770, was by trade a baker and was a small man – 5’2” (158 cm) tall. It must be presumed that he had undertaken some similar feats prior to arriving in Blackheath but records of these seem to have been lost. The Blackheath walk is the first mentioned in his entry in the Popular Biography of Northamptonshire published in 1839. He continued to perform almost Herculean feats over the next few years – on 5 December 1816, he completed 1998 half-miles in 1998 succeeding half hours on Brixton Causeway (now Brixton Hill & Brixton Road) – it was to be 2000 but after a dispute with a backer he issued a ‘press release’ a ended the walk an hour early. 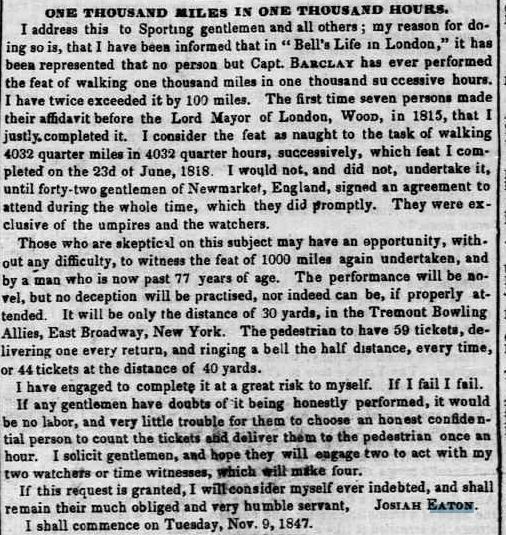 In June 1817 he successfully competed with another walked, called Baker, to complete 2000 miles in 42 days. In August and September 1817 he walked from Colchester to London one day then back to Colchester the following day – a distance of 51 miles, completing the circuit 10 times. In Stowmarket, Suffolk, in 1818 Eaton took the lack of sustained rest to a new extreme – walking a quarter of a mile every successive quarter of an hour for six weeks – finishing just before 2:00 pm on 23rd June 1818. 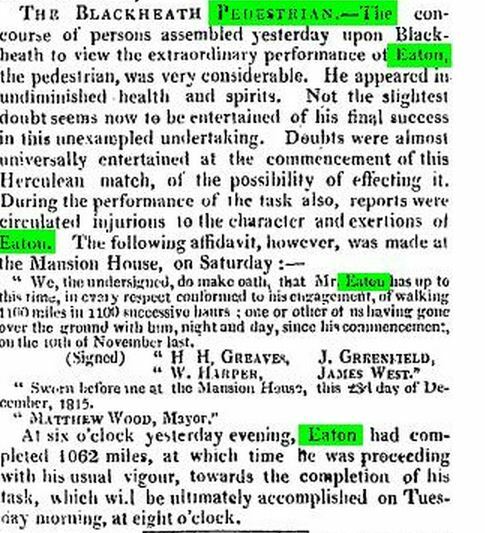 That appeared to be the end of Eaton’s walking career but he then re-appeared in New York aged 77 proposing again to walk 1000 miles in 1000 hours in November 1847 at a 30 yard course at a bowling alley. While it is known that he started the feat, Scientific American mentioned it in passing; it isn’t known whether he completed the walk. The Times (London, England), Saturday, Aug 24, 1816; pg. 1; Issue 9922. This entry was posted in Blackheath History and tagged George Wilson, Josiah Eaton, pedestrianism on September 3, 2015 by Paul B. Having merely walked across the Heath exposed to wind and rain and it seems to never end I can testify to this feat! Well done sir! Indeed, it is a staggering feat, particularly at that time of year, add in the toll on the body that the sleep deprivation must have had and it is truly amazing.